It's 1998 and two families across the world begin the long path that will bring them together, families reunited, then separated again. In Cambodia , a little girl is almost four years old. 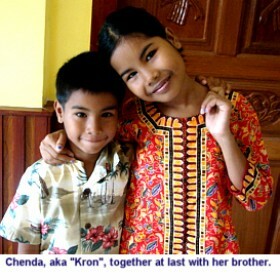 Though her name is Chenda, she is called by the affectionate-name, Kron, after a little fish found in rice paddies. Like most Cambodian children, she's not very big. Her parents sometimes don't have enough money to buy food and she goes hungry, but for all that, she's happy and feels loved. Daddy works as a day laborer for a team that puts up tents for celebrations like weddings and funerals, but the work is infrequent. Kron works alongside her mother at home, eager to help. She washes out clothes, gathers wood and helps to plant their little garden. Money is tight and her parents fight a lot, which makes Kron worry. But there are still days of laughter and playing, and life with her parents in their tiny house is good. On the other side of the world, in Arkansas, a family begins thinking about adoption. John and Kerri Evans have two children, Callie, 10 and Sawyer, 6. Their son, Sawyer, has had heart surgery twice but he's doing well now and he wants a baby brother or sister. They know they want more children and adoption calls to them. They choose an agency and decide to look into Cambodia . Paperwork starts to pile up and late one night they get a call from their agency. Would they consider a baby who is 6 weeks old? Two days later, Kerri learns she's pregnant again. They decided to postpone their adoption until this surprise baby is born. A year goes by and Kron is a little bigger. Mom is expecting a baby. She whispers this to Kron one day when they are lying down for a noonday rest. The rhythms of village life are quiet, with everyone taking a nap during the fiercest sun at noon to two. Kron's sleepy but the news is so exciting. She doesn' t have much, and to get her own little brother or sister is wonderful. She can hardly wait. But Mom and Daddy are still fighting a lot. Kron hears her mother say to her father something about another woman who lives close by.. Daddy gets angry and leaves, sometimes for a night. But the news of the baby makes him happy, and Kron hopes maybe things will change. One day, the fighting gets worse than ever. Daddy gives his little girl 1,000 Riel (equivalent to 25 cents) and then he leaves. Mom makes her throw it away. Daddy's got a new girlfriend who lives nearby and he doesn't come back to stay at th e house again. Mom says Daddy has an illness and maybe Mom has it too. Things get worse. Mom's tired from the baby, and there's never enough food. Mom cries a lot and misses her husband. Mom is sick too and is coughing a lot. Sometimes she coughs blood. She tries not to let Kron see, but she knows. People in the family say that Mom wanders around as if she has no soul. Kron is five, but she can help. She tends the fire for her mom, helps cook the rice they have, wash the clothes and gathers fire wood. Her aunt and uncle live nearby with their daughters, and even though Kron's cousins are mean to her, teasing her and pinching her sometimes until her face bleeds, they do share their food sometimes. Once, Kron goes three days without eating. She can see all her own ribs. She's hungry all the time, but mostly, she worries about her mom and the baby. Across the world, a baby boy is born in Arkansas to the Evans family. Hayden is healthy and strong, and loved by everyone, especially his big brother, Sawyer. Sawyer can't wait for the baby to get big enough to play with. The two older children read books to the baby and hold the baby and try to teach him how to crawl and even to walk as his first birthday approaches. Kron has a new baby brother . He is tiny. It's February 2000. Sometimes when Mom goes to look for fish and pick wild vegetables to make a meal, Kron stays behind at their house. It's a grass shack on a dirt floor, with the new baby in a hammock tied to the wall. Kron pulls a string tied to it to swing the baby to sleep. While he naps, she washes out his clothes and lays them out carefully to dry. He sleeps naked, but when he wakes she will put his little shirt on him. Like most babies in their village, he doesn't wear diapers. When the baby wakes and cries, Kron goes to the door and calls her Mom. Mom comes and feeds the baby and then they all lay down on the mat together to sleep. Kron loves the baby so much. She lays his little head on her arm and watches him until he falls asleep. Then she falls asleep herself. When she wakes, the baby is not there. Mom is outside. Kron can hear her crying and she goes to see what is wrong. "Where did he go? When will he come back?" "I don't know where he is and he is not coming back," Mom answers and her voice is tired. Kron cries out "Where did he go? Where did he go?" but there are no answers now. Kron and her Mom cry and cry. When Kron remembers those days, she says she cried for a hundred days for her baby brother. Mom now has money for rice. It won't last long and Kron wishes she had her brother back. The phone rings in America at the Evan's house. It's the agency. Will they take a three month old baby? They hadn't planned to add another child so soon, but the Evans decide that this baby is meant for their family. When they ask about the birth family, the agency says the baby is abandoned with no birth history. Someone unknown dropped him off at the oprhanage.The doctor there thinks the baby might have a heart problem. The Evans know what it's like to parent a child with heart problems, and they're sure this baby is meant for them now. Six weeks later, Kerri is in Cambodia . The orphanage calls him Vuthy, pronounced 'wu-tee', and the Evans keep that as his middle name. Kameron Vuthy Evans is about five months old and weighs just nine pounds. He has hair that sticks up on the top of his head. His soft spot covers most of the top of his head. He is quiet and reserved the first day, but he is such a good baby. Kerri meets the women who took care of him in the orphanage. She is told that this woman knows about his birth family. They lived in her village until she came to work in Phnom Penh . The news is confusing after what the agency said, but Kerri is assured this family could not care for the baby. Within 48 hours, she is on her way back to Arkansas with Kameron. Sawyer and Callie are so excited at their newest little brother. Hayden is fifteen months old, and he loves the baby, kissing Kameron and petting him as if he were a puppy. Hayden is still nursing and Kameron decides he would like to nurse as well. Both boys share their mom's milk and the love of the whole family. Kerri thinks this helps the two new boys adjust to one another. Kameron turns out to be healthy. There's nothing is wrong with his heart, such happy news. In Cambodia , Kron is now six years old. Mom is sicker and sicker. Sometimes she can't even get out of bed. Kron is very worried. One day, when she's seven, she wakes up and Mom is still in bed. Before, when Mom was not sick, she would always get up and have rice ready for Kron, if there was food in the house. These days, Kron has to do the cooking herself. Kron lets her Mom sleep while she gets the rice ready for breakfast. She calls to Mom, it's almost ready to eat. She goes over and shakes Mom. She does not wake up. She calls and shakes, but Mom does not move. She runs next door to her Aunt's house. They tell her what she knows. Mom is dead. Kron is not sure she will be able to accept it. She falls on the ground and cries and cries. For the next three months she lives in the house with the mean girls. She sits alone and cries. Her Dad never comes to see her. Kron sees him in the village from time to time but he never acknowledges her at all. One day one of Mom's cousins comes to her Aunt's house. Cousin has four boys and no girls. In Cambodia when the boys marry they move in with the bride's family. The cousin wants a girl for her family, and Aunt has all girls and no sons. They agree that the burden of Kron will pass on to the married cousin, and pack the few things she owns. She rides for two hours to Cousin's house. Cousin is married to an older man. He's nice and quiet. Two of their boys are married and live nearby. The other two sons live in the house. But Cousin is not always nice to Kron. Seven-year-old Kron immediately has to start doing house work like a grown-up. Kron did not mind helping Mom and even doing most of the work herself because Mom was sick, but Cousin is just lazy. Kron cooks lunch for the family and goes to the market. Everyday she must sweep the inside of the house, do the cooking, go to the market for the food and wash the dishes afterward. The rest of the family is watching TV in the evening but not Kron. She must go to the market and beg for her supper. Sometimes people give her little bits of money and she can buy rice or bananas or if she is lucky, dried fish. She is not nearly as hungry here. She eats every day but no one loves her. She wants to go to school. Before Mom got sick, she went for a little while but then she had to come back home. She cannot read or write. Kron's head itches because she has lice. Most people have some but Kron has lots and lots of them. The only way to get rid of them is to have someone pick through your hair and take them out by hand. No one takes the time to do this for Kron so she scratches and scratches and some times her head bleeds but it never gets better. Kron showers from a bucket with a sarong around her. She is not allowed to use the soap. Sometimes she cries herself to sleep. As the months drag on, even tears abandon her and each day drags along into the next. Kron marks the passing seasons since Mom has died, and knows that three years have passed. Kron misses her so badly. She wonders what ever happened to her little brother. In those three years, the Evans family has struggled with illness and tragedy. Sawyer, full of life, in grade school and doing so well, gets sick again and is listed for a heart transplant. The miracle happens and he is matched. The Evans are filled with hope that their son will grow and live a full life. The transplant operation is in June 2001. Ttwo months later, Sawyer dies from complications of the surgery and a massive antibiotic resistant bacteria. At this same tragic time in their lives, the agency that handled Kameron's adoption has pled guilty to crimes relating to their adoptions in Cambodia. The facilitator the Evans used has been arrested and will be tried for the same crimes. Rumors and allegations swirl. The Evans are distraught at the double blow, grieving for Sawyer and worrying about Kameron's adoption. They don't even want to think something might have been wrong in their adoption but they remember the conflicting stories they were told and fear it might be true. They are eligible for another adoption from Cambodia and families are beng included in a 'pipeline' to be processed at a later date but still reeling from the death of Sawyer, they decide not to put their name in for another adoption from Cambodia. They don't want to be involved in the adoption court case. Their entire family needs time to heal. A few years pass, and in 2004, the Evans adopt their beautiful daughter Nonthinee, 'Noni', from Thailand . She is an older waiting child, listed with special needs, and she is also an answered prayer. Beautiful and full of life, she brings a new, bright light to the Evans family. Is Kameron legally adopted? Was he truly an orphan? What is the truth? Several months after Nonthinee joins their family, they finally decide they must search for Kameron's birth-family in Cambodia . There are reports of children being bought from birth families and sold to the orphanages. They feel they must know. They find a searcher who is recommended by others on a yahoo CambodiaAdoptList. They tell the researcher the name of the nanny of Kameron and that she knew the birth family. A few days later a detailed birth history and pictures are emailed to the Evans family. Finally, they know the truth. Though now legally orphaned, Kameron was part of this facilitator's immoral adoption scam. And he has a sister. It is now nearing Christmas in 2005. Each day the family studies the photo of Kameron's sister and wonders about her. Is she safe? Is she being cared for? Does she wonder what happened to her brother? Their hearts worry about this child as if she were their own. Her legal name is Chenda, though she has the nickname of 'Kron'. She looks so much like her brother, Kameron. They even have the same hair cut. Her eyes look so sad. She has that look that says she just can't afford to care anymore. The Evans family decides they must learn the answers to all of their questions, and plan a trip over Christmas for the entire family to fly to Cambodia . Through a friend of a friend, they have learned that the situation with Chenda, "doesn't seem right". This friend has visited to check up on Chenda, whom she finds most often sad, dirty and alone in the house. The Evans' worries increase. In Cambodia , Cousin goes back to the village to visit Aunt and brings Kron. There's a man there, asking questions. He has a photograph of her baby brother. Kron can hardly believe it. Where is he? She is told he is in America . She does not know where this is but she has heard of it before. It is a very nice place. People always say if you can go to America you are set for life. Kron is happy. Baby brother must be OK if he is in America . In Cousin's house, things are very hard for Kron. She gets sick with diarrhea and high fevers. Cousin makes her sit for coining. A woman comes to the house and scrapes her skin with a coin or shell. Kron is still skinny and it hurts so bad that she cries. Cousin slaps her head and tells her to be still. The Evans arrive in Cambodia in December 2005. They are excited to meet little Chenda/Kron. They see her the day after they land in Cambodia . She is so thin and her skin is yellowish. She is shy and smiles sweetly for their pictures. She holds on to Kameron's hand and will not let go. It is apparent that her connection to him is stronger than they could have ever imagined. She is part of him, and he of her. The Evans are staying with another adoptive family. They have five Cambodian kids who still speak Khmer. Kron stays at their house for two days. They want the kids to get to know one another. Almost immediately, Chenda tells one of the other kids "Please tell them I don't want to go back. They are not nice to me there. I want to stay with Kameron." The Evans are worried about Chenda's health and take her to the doctor. She's diagnosed with malaria and typhoid. She's losing weight every day. Her hair is full of lice. Their Khmer friends tell them that a child being taken care of would never have that many lice. No-one is looking after this little girl. The Evans talk to Cousin. She does not want Chenda anymore. She thinks she is more trouble than she is worth. Are the Evans sure they want her? She is not a good girl. If they take her, she tells them, she will be grateful. The Evans realize Chenda is not wanted, not loved and not cared for. Except by them . The adoption is filed in Cambodia. John must return to the U.S. for his work. The Evans know that there is a moratorium on processing orphan petitions from Cambodia, but what can they do? Chenda needs them and she is the full-biological sister of their son, Kameron. Chenda is happy with the Evans. They love her and don't beat her or make her work. She is so, so happy to see Kameron again. She remembers him vividly, she remembers waiting outside the hut for him to be born and even the movements he made with his legs the first time she ever saw him. If she could just get better. The nagging illnesses and weight loss are finally diagnosed. In addition to her other illnesses, she is found to have latent TB. Slowly, she recovers. The Evans get their final adoption papers and request an adoption visa. It is denied. They hire an attorney and apply for Humanitarian Parole. Even though they jump through a lot of hoops and it seems like they will be approved, they are kept on tenterhooks and told not to talk about their case publicly. Still, the case is denied. They apply again and are denied again. Out of necessity, John is working in the US and traveling back and forth to Cambodia . In May, Chenda and Kameron's big sister Callie goes home for her high school graduation and on to college. Kerri has to miss it. Months pass in Phnom Penh , Cambodia where Kerri, Kameron, Chenda and Noni (their daughter from Thailand with multiple special needs) now reside. Husband John and oldest daughter, Callie, are in the USA . The days pass slowly as the Evans wait for further word on their plea to bring Chenda home with her new family. Chenda cannot be left behind, abandoned once again. Near their little home in Cambodia , a ragged little boy plays and sleeps in the street. Both his parents are dead, and he has been living with extended family. Considered a burden, the relatives turned him out into the street, where Kerri and her family would pass him on the way to market.. The little boy still attempted to enter his relative's home for food at times. These attempts were met with such severe beatings by his relatives that neighbors had to step in, fearing for the child's life. Kerri, unable to harden her heart against this tiny child's plight, takes him into their home. His Khmer name is Nwootk, it's difficult to pronounce it so they call him Noah, as close as they can. Noah thrives in the care of Kerri, turning from a terrified little boy into another rowdy, sweet-natured brother that Chenda bosses when they're playing together in the courtyard of the Evans' rented house in Cambodia . What can they do? Little Noah must join the family as well. The Evan's family today : It has been eighteen months. John visits, and sometimes Callie, but the family is in limbo waiting. It is impossible to consider leaving Cambodia without Chenda and Noah, and unbearable to wait for some resolution to the issues. At this point, Chenda and Noah are legally adopted. However, due to the immigration freeze on children adopted from Cambodia , they cannot come to the USA with their family. They have been denied even a tourist visa that would allow them to come to the USA while their immigration status is reconsidered. The Evans' main hope lies in the hands of Senator Pryor from Arkansas . The Evans need an immigration waiver or humanitarian visa for their family to be reunited in the USA . It will take considerable effort to receive either. One important note: The Evans are not the only family caught up in circumstances such as this. There are other American families living in the USA and abroad who are aware of birth siblings to their adopted children, and would also like to adopt these children. These orphaned siblings are also barred, due to immigration laws, from coming to the USA . The truly best solution would be for our Senators and representatives in Congress to recognize the unique situation these families and children are in. There needs to be an Immigration Bill drafted that will specifically focus on the reunification of separated siblings. As a community, adoptive families are in the unique position to rally behind families who are separated in this way. Please consider adding your voice to this important cause. Martha Osborne, Editor RainbowKids.com Adoption Advocacy Website.